A car and driver will be waiting for you at the port to take you to San Gimignano where you will meet our guide and begin the visit to San Gimignano and Siena. At the end of the excursion you will be taken back to the port. Picture yourself sipping Tuscan wines and strolling through the atmospheric medieval streets of a hilltop town. Tuscany has enchanted generations of visitors, and on your Livorno cruise excursion to Siena and San Gimignano allows you to discover the highlights of these beautiful, characteristic Tuscan towns in the company of an expert guide. This is a unique opportunity to visit some of the most picturesque places in Italy, located in the in the green valleys of the Tuscan countryside, while learning about the fascinating artistic and cultural heritage of Siena and San Gimignano. Our Tuscany private tours have been carefully designed to optimise your time in Siena and San Gimignano, including private transfers to and from the port. You’ll be amazed by how much you can experience in the course of a single day, discovering the rich history of these spectacular towns as you explore at a leisurely pace. San Gimignano is one of the prettiest towns in Tuscany - a charming walled medieval town perched on top of a hill, offering stunning views of the surrounding countryside. You’ll have plenty of time to explore San Gimignano on your cruise excursion, wandering through the narrow alleyways and getting a taste of local life in its piazzas. The elegant Piazza del Duomo was the centre of political and religious life in the medieval town. On your visit to the church of the Collegiata, you’ll see some striking 12th century frescoes, including Taddeo di Bartolo’s Last Judgement - a terrifying vision of hell. Your expert guide will also show you other works by Tuscan artists, such as The Creation of the World by Bartolo di Fredi, and the Life of Santa Fina by the Renaissance painter Ghirlandaio, enriching your appreciation of the art by explaining their historical context and pointing out intriguing details you might otherwise miss. The nearby Piazza della Cisterna - named after the old well in the centre of the square - has an unusual triangular form and is surrounded by some of the oldest, most beautiful buildings in the city, including some characteristic medieval towers. A walk through the historic town centre takes us to the ancient fortress of San Gimignano, known as the Rocca. 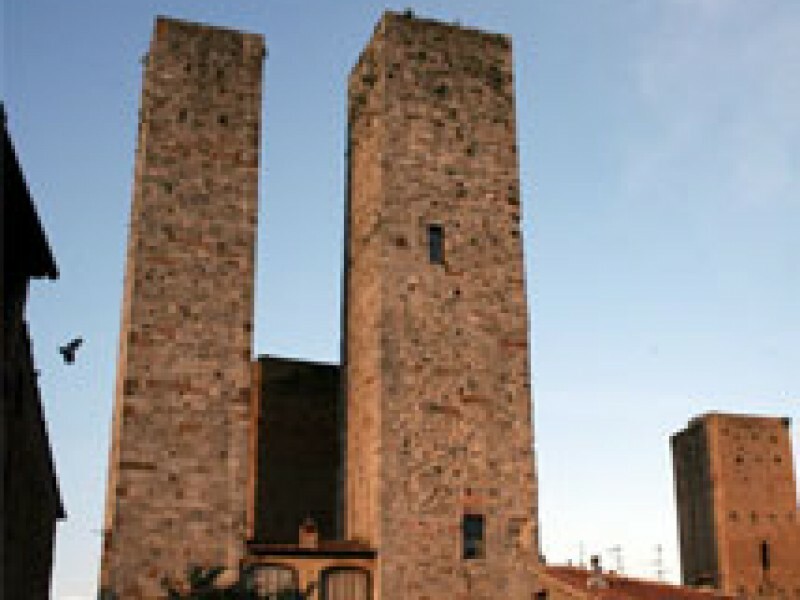 Your private tour of San Gimignano will end with a climb up the tower, admiring the spectacular views of the town and the beyond. 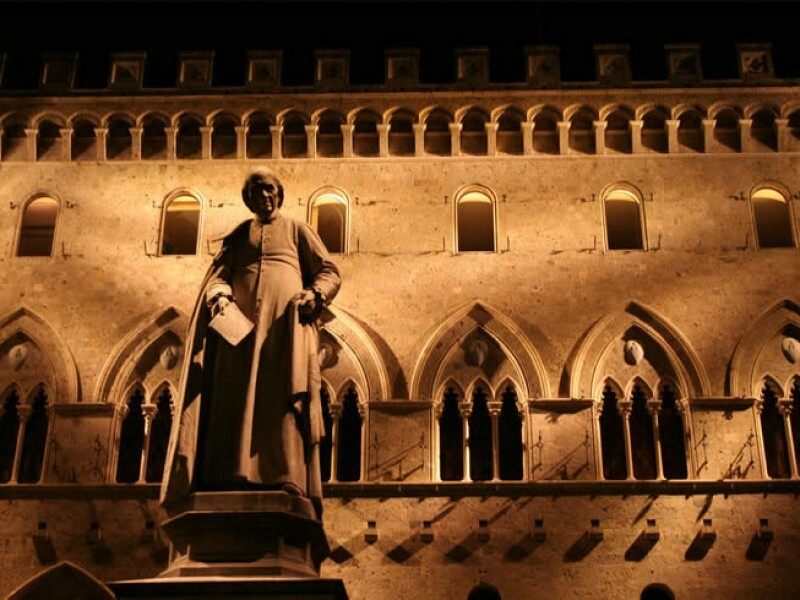 Our next stop is the medieval city of Siena. On your cruise excursion to Siena you’ll discover how the city thrived in the Middle Ages, and was saved from decline in the 17th century through the introduction of the Palio - a famous horse race that still takes place in the central piazza today. As you explore the atmospheric back streets and grand piazzas of Siena, you’ll learn all about the city’s rich history, and understand why it’s been enchanting its visitors for centuries. The most famous of Siena’s squares is the magnificent Piazza del Campo. Located in the historic heart of the city, this shell-shaped square is surrounded by elegant palazzi, and is widely regarded as one of the greatest medieval squares in Europe. Piazza del Campo has always been at the centre of Siena’s public life, and, as the location of the grand Palazzo Pubblico and the Torre del Mangia, it also had an important political role. 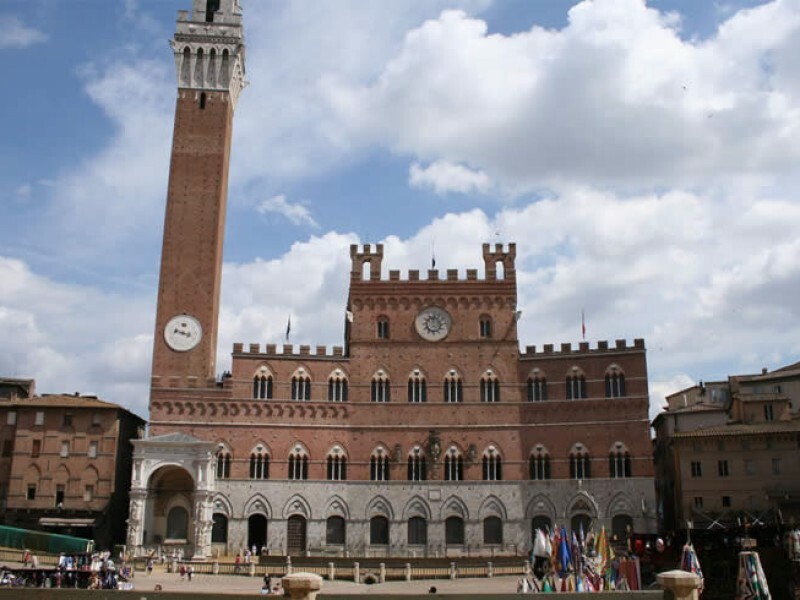 On your Siena private tour you’ll stroll through the piazza, admiring its architecture while learning about the politics and commerce of the medieval city with your personal guide. From Piazza del Campo it’s a short walk to another famous square in Siena, the Piazza del Duomo. The piazza is dominated by the imposing 13th century cathedral, which has a striking facade of black and white marble. On your visit to Siena you’ll learn all about the history, myths and legends of this remarkable place, and discover why black and white are the traditional colours of the city. Your journey to Siena will end with a short walk to the Basilica of San Domenico, which sits on top of the hill. This vast 13th century church was enlarged to incorporate many features of Gothic architecture, as your guide will explain on your visit to the church, pointing out interesting architectural features, and curiosities such as the relics of St Catherine. After your visit to San Domenico you’ll enjoy the breathtaking panoramic views of the countryside - the perfect end to a memorable day in Tuscany.